Blog Carol, Aaron, Bryan and Alfonz - May begins! Carol, Aaron, Bryan and Alfonz – May begins! Carol, Aaron, Bryan and Alfonz made sure that May started with a bang! 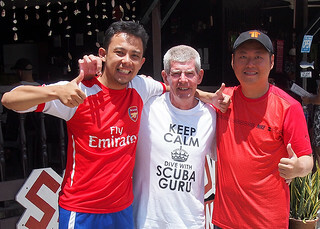 Carol and Aaron were booked in with me by my good friend and former student Tioman Ah Poh who runs a snorkeling business here in Salang, whereas both Bryan and Alfonz came to me directly from my web site. Bryan had originally planned to do his PADI Open Water course with his wife, but she decided that this was not a good time for her and sat this course out. He actually booked to do his Open and Advanced Open Water package, and was so taken by diving and by Salang that he wanted to go straight onto his Rescue Course. 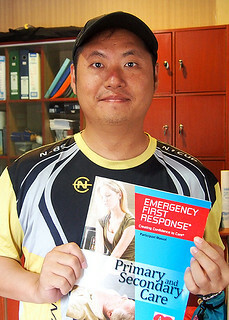 Time made that impossible, but we did manage to get his Emergency First Responder Course done within the time frame. Alfonz originally booked himself in to do his Open Water, but he allowed himself enough time to carry on to take the Advanced course as well, but with the option of taking his time over the Open or going on to do some of the other activities available in Salang. As it worked out he took to the diving quickly and easily and fell in love with it! Since he got on so well with Bryan he soon made up his mind to carry on and complete the two courses. That is fine with me unless my schedule makes it impossible. He was still entitled to the same discount and even if one of my customers booked both courses but changed their mind and didn’t take the Advanced, there would be no penalty to pay. I understand that it is a big leap in the dark for a non diver to book both courses, so flexibility is needed and there is no need to be too strict about these things. Sadly Carol and Aaron were on a much tighter schedule and even though I think they might have been a bit envious of the other guys, when work calls you have just got to go! But they got their Open Water certificates as they had planned, had a great time doing it and made some new friends as well! Bryan on the other hand has completely caught the diving bug! He is planning to come back to complete his Rescue course just as soon as he can, and his wife still wants to take her Open Water certification as well. The have actually booked in to come back during the first week of July, so it looks like that month will start with a bang too! !